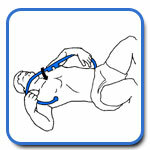 Neck pain is one of the most common musculoskeletal complaints for which people seek health care assistance. 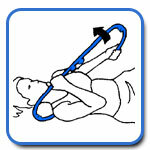 Postural strain, trauma, muscle imbalances, and “wear and tear” can all lead to dysfunction and pain. 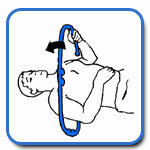 The techniques illustrated below can decrease tension and stress, improve flexibility, and ease pain. The mid back consists of the thoracic vertebrae, ribs, shoulder blades and the muscles and connective tissues that join them together. 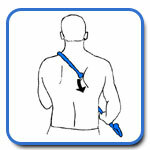 The thorax is the most stable region of the spine, but is not immune to pain and dysfunction (as many of you know!) 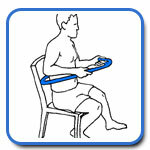 Postural dysfunction, muscle imbalances, and stiffness are common in this area. 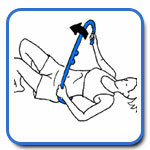 The MyoTool excels in reaching and treating the mid back in ways that no other device can. Low back pain is an epidemic. We know that getting enough exercise, quitting smoking, losing weight, and avoiding harmful postures and activities are part of the answer. 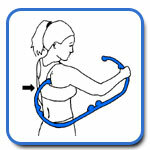 Additionally, these techniques using the MyoTool will encourage tissue mobility and extensibility and muscle relaxation as well as decrease the discomfort associated with mechanical low back pain. Have you ever experienced stiffness or achiness in your wrists, forearms, or elbows after spending some time at the keyboard? 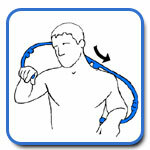 How about shoulder or elbow discomfort after playing a match of tennis? 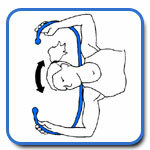 Try using these few techniques to address problem areas in your shoulders, elbows, and forearms. Buttock and hip pain are frequently related to lower back or pelvic problems. 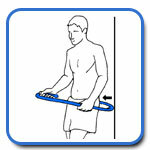 Other times a hip pain is just what it seems – a problem at your hip. 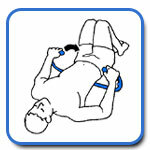 Regardless of the origin, the buttock and hip muscles can become tight and painful. Maintaining or improving the mobility and flexibility of these tissues can go a long way in correcting discomfort and dysfunction in this region. Cramping and tightness are common complaints in the legs and feet. 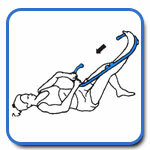 The MyoTool can be used to assist in stretching the hamstrings, thighs (quads), and calf muscles. Pumping techniques over the leg muscles or along the plantar fascia on the sole of the foot are effective at improving tissue mobility and easing discomfort in those areas. Each technique shown here was “discovered” using creativity and experimentation. 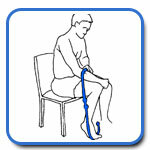 As you use the MyoTool, you will discover additional techniques that feel great to you and provide relief. If you would like, you may email a description and/or a picture of the technique by clicking here. We may choose to share them with others on our User Discoveries page. Enjoy! !